The brilliant Fun with Bells podcasts are aimed at non-ringers and new ringers, with useful hints and tips and interest for experienced ringers too. One of the first 3 podcasts is with Emily Hall, the founder member of Derbyshire Young Ringers, who started ringing at age 7. Emily gives lots of interesting tips on how to progress your ringing, and Pip Penny gives further tips at the end of the podcast, so please listen until the end. Emily also encourages anyone who might be interested in ringing to give it a go, as that is the only way of knowing if it is for you. Links to this and other episodes are also available via the Bell Ringing Derbyshire Facebook page – please like and share with your friends. You’ll find all of the episodes on the Fun with Bells website, where there is an option to subscribe to hear about new episodes as they are released, so please sign up. You can also find Fun with Bells on its own Facebook page – please like and share. Sharing these podcasts is an easy and entertaining way of explaining to people what ringing is about, so please use them to promote ringing. Let’s get everyone listening to them! Display a notice with ringing times and contact details in the church porch or outside notice board. Download one from the Porch Notice section below. Keep a stock of ringing flyers with your tower contact details on for giving to non-ringers and putting out in church. Download one from the Flyers section below and customise it with your tower’s details and ringing times or contact PRO@derbyda.org.uk. Encourage wedding couples to see what they are paying for after they book the bells for their wedding by inviting them to your practice: explain about ringing and give them a backstroke taster lesson and a flyer. Perhaps arrange it so they can pay the bell fee at the same time. Put a display inside your church about ringing locally: your bells, your ringers and your ringing achievements. Make use of open ground-floor ringing chambers and tower doors as display areas. Put some flyers nearby. Use a colourful display about ringing when you open the tower for visitors or to use when you give a presentation. Download the pages you require from the Displays section below. Send a photograph and short article about your ringing for a special event to local newspapers and magazines. If your article is people-focused and cheerful it is likely to get published. Contact your local radio station about your forthcoming event or ringing achievement to get a mention on the radio. Use the Bell Ringing Derbyshire Facebook page to promote your ringing and share it with your friends. Ensure that your church website has a bell ringing section with links to and from this website (http://www.derbyda.org.uk). For further ideas and advice, download the CCCBR Engaging with the Public leaflet, explore cccbr.org.uk/pr/advice, or email PRO@derbyda.org.uk. Download this PDF onto your computer: Bell Ringing Flyer. Open the PDF, click in the Contacts section and type in your contact details (ideally a name and phone number plus your tower’s @derbyda.org.uk email address, plus other information e.g. ringing times, website, Facebook page, etc) (maximum 2 lines of text). Print on one side at a time then turn over the paper and print the same on the reverse and cut in half. Download this PDF onto your computer: Tower Porch Notice. Open the PDF, click in each of the 4 sections and type in the details (1: Tower name and/or a short introduction/description; 2: Bell details; 3: Normal ringing times; 4: Contact details ideally a name and phone number plus your tower’s @derbyda.org.uk email address and relevant websites and social media pages). Download this PDF onto your computer: Tower Open Day Poster. Open the PDF, click in each of the 4 sections and type in the details (1: Tower name/location; 2: Date; 3: Times; 4: Contact details and/or more information about the open day). Download this PDF onto your computer: Special Bell Ringing Poster. Open the PDF, click in each of the 4 sections and type in the details (1: Tower name/location; 2: Date; 3: Times; 4: What the ringing is for; 5: Contact details and/or more information). Download this PDF onto your computer: DDA Event Poster. Open the PDF, click in each of the 8 sections and type in the details of the event. Here are clear and colourful displays about ringing. Please feel free to download as much as you would like to use. Your perfect hobby? Lists the benefits of bell ringing, describing it as the perfect hobby – and a comprehensive list it is too. May be used as a display poster or additional flyer. 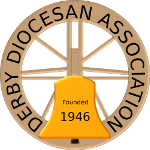 The DDA has one eye-catching, self-supporting roller banner for indoor use (or in a gazebo/tent), which may be borrowed (subject to availability) for any event within the Derby diocese where ringing is promoted (e.g. tower open days, fêtes, fayes & festivals). The banner is the same design as the CCCBR banners – click here to see images. For further information or to borrow the banner, please contact the Public Relations Officer. More publicity material is available on the CCCBR website. This includes information on borrowing outdoor Feather Flags. Produced by Sue Hall: Sue is happy for anything to be used providing her name is kept on the copy. Acknowledgement: Some images used in this material have been sourced from the internet.